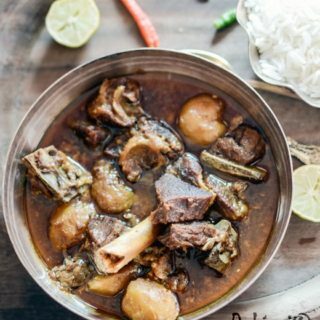 With this post, I have coming up with a unique mutton recipe with no added onion and garlic, Niramish Mangsho. 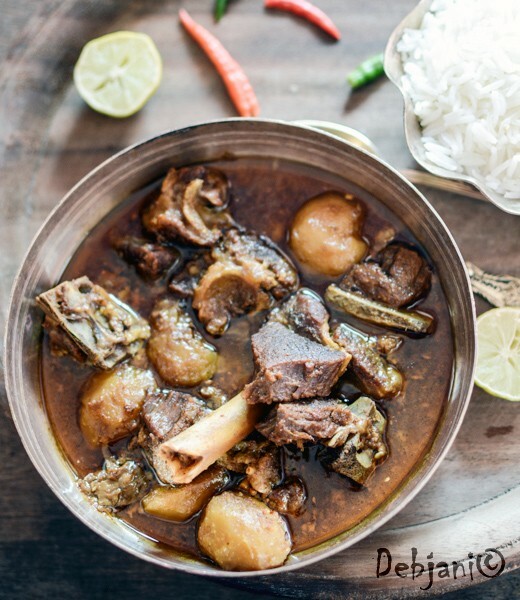 A Bengali delight, Bhoger Mangsho or Niramish Mangsho is indeed a special dish to me. Growing up in a North Kolkata house with 28 members, I am fortunate enough to witness different flavors of Bengali culture and rituals. Not that I adopted everything but yes I experienced everything and ended on making some set for me to follow. Kali puja has always been special to us and it never been Diwali to celebrate at our part of the city during that time. I have seen my father fasting for the entire day (and night) of Kalipujo and I somehow felt spirited having seen him. I also started doing the Kalipujo fast with Baba when I was a teenager. On the other hand, my mother’s maiden side; to be precise my grandmother’s family are originally from a village of Jharkhand, known as Maluti. I used to visit that tiny village with Maa almost every year during Kalipujo. The place is nearby (well almost) to the famous pilgrimage of Tarapith. Maluti itself is known for the temple of “Devi Molikha”. Surrounded by the plateau of Chota Nagpur, Maluti indeed is a place to explore for the eternal beauty of nature. However, apart from the natural beauty, what attracted me more was (and till now) the festival of Kalipuja there every year. As the place is having the influence of tribal community and Santhal tribe to be specific, the Kali puja is also influenced by the tribal flavor as well. Eight significant Pujas including the Royal puja of Devi Molikha and not to mention one out of the eight pujas is totally followed the tribal processes. Believe me, witnessing the puja of Ma Kali (for me specifically the Santhal Puja) was something spirited me a lot all through my starting years and even today. In addition to the other rituals, sacrificing a livestock which is known as “Boli” used to be quite common during Kalipujo. Maluti is no exception to this and in fact, this is what famous in many places including Kalighat. Having the specially prepared sacrificed meat is a ritual on the consecutive day of puja. 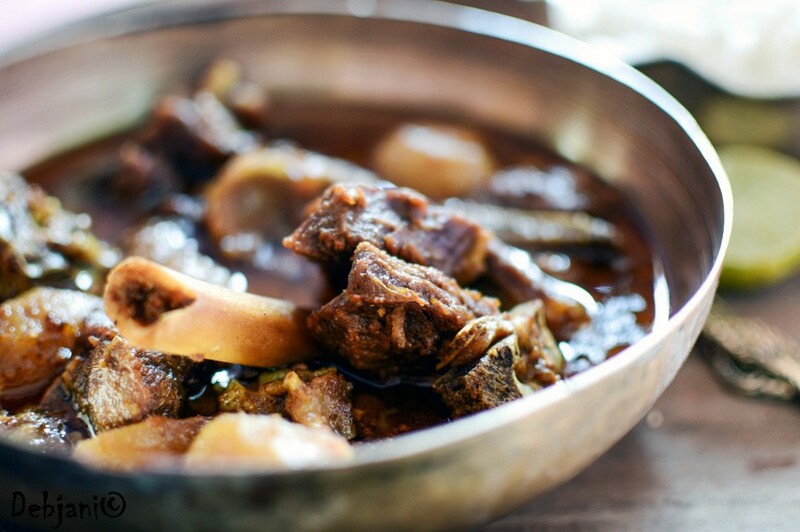 Having said that, the “Pujor Mangsho” or the meat (mainly mutton or lamb) that is considered as the “Prasad” is never been prepared using Onion and Garlic, in fact, that is the specialty of the Bhoger Mangsho or Niramish Mangsho. 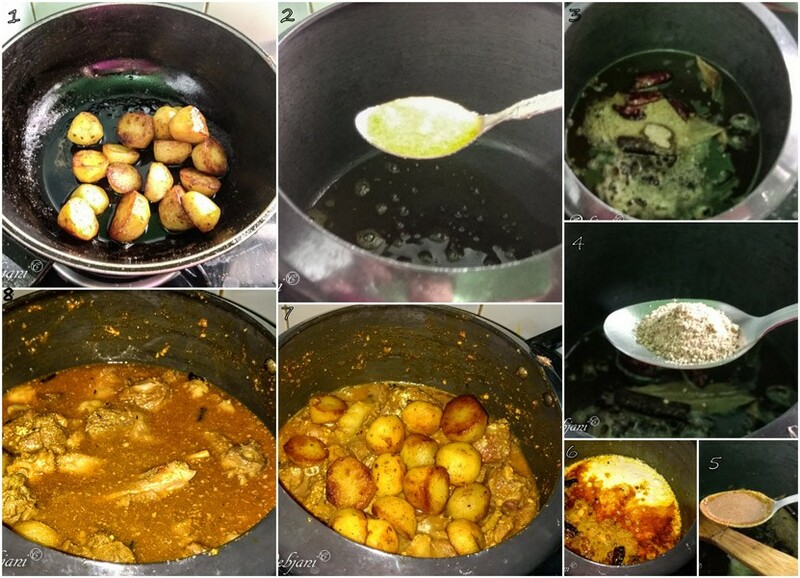 This is what used to be prepared thereafter the day of Kalipujo every year (in fact till now). I have not visited Maluti for years thanks to my now busy life. However, I cherished listening to my mother every year about her experience being there. I can’t even imagine Maa not visiting Maluti during Kalipujo. 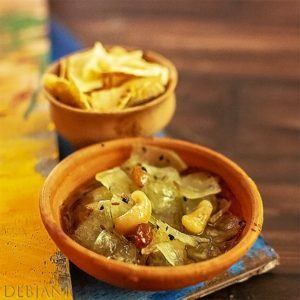 Coming back to the Niramish Mangsho, I have had the Niramish Mangsho in a different form. However, the main thing to remember is to not to prepare it using Onion and Garlic. As Onion is not part of the dish, to give it a distinct flavor use of Asafoetida or “Hing” is a must while preparing the Niramish Mangsho or Bhoger Mangsho this is what I learned from my Dida. The dish is not influenced by fancy spices but the use of basic spices and processes. I personally don’t even use Tomato in it. I do cook the Niramish Mangsho every year on the day after Kalipujo! This is probably my way of looking back to my childhood and to cherish the special aroma of the runny mutton curry. Now on this note let us have the recipe of Niramish Mangsho the way I prepare it. For me, my Niramish Mangsho is incomplete without Aloo (potato chunks) and also Ghee tempered spices in it. Not to mention, carefully chosen mutton with a little addition of fat (say 10%). 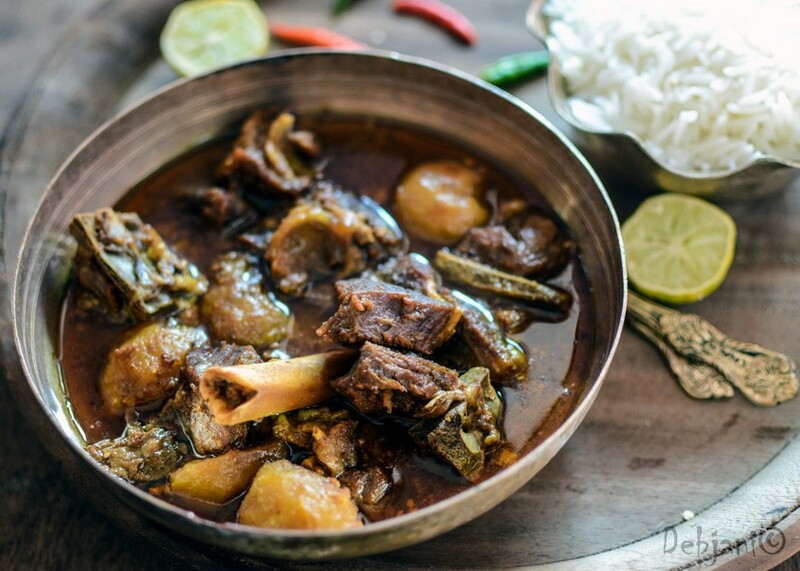 A traditional Bengali Mutton Curry; Niramish Mangsho prepared with no onion and no garlic. Asafoetida / Hing: 1 Tsp. 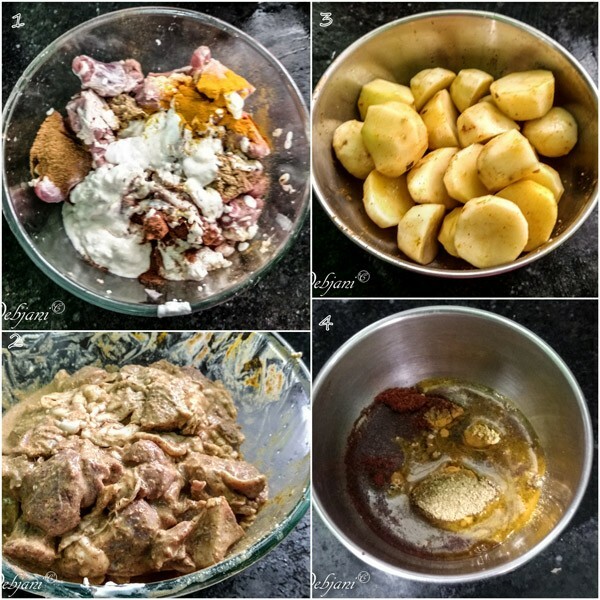 Wash and pat dry mutton pieces and marinade with 100g Card, 1 Tsp. Cumin Powder, 1 Tsp. Coriander Powder, 1 Tsp. Turmeric Powder, and ½ Tsp. Red Chili Powder for around 8 hours. Peel and cut potatoes in half and smear little turmeric powder over the potatoes. Mix rest of the Cumin Powder, Coriander Powder, Turmeric Powder, and also Red Chili Powder with 1 Tbsp. of Mustard Oil to make a thick paste. Make a smooth paste of Ginger as well. Be handy with a pot full of boiling water. Heat remaining oil in a pan. Fry Potatoes till those turn golden brown in color and strain potatoes from the pan. Now shift the remaining oil in a deep pan and add Ghee to it and heat. Temper the oil with Bay Leaf, Red Chili, Clove, Cinnamon Stick, Green Cardamom, Black Cardamom, and Asafoetida. Cook for a minute until the tempering leaves amazing aroma. At this point add sugar and continuously stir it using a ladle to caramelize the sugar but be careful to not to burn it. Now add Ginger paste to the mixture and cook for 2 minutes in low flame. Now add a little water if found the spices sticking on the edges of the pan. Add the spice paste as well as some salt and cook for 3-4 minutes in low flame. Add curd after beating it to the mixture and mix continuously and cook for 5 minutes or until the mixture thickens and release oil. Add fried potatoes at this point. Keep the flame low and let the mutton cook in its own water for 20 minutes with a lid on. Add 4 cups of boiling water to the mutton and increase the flame a bit and keep the mutton cooking now with the added water. It should take 15 more minutes to cook the mutton properly with the lid of the pan on or maybe more depending on the quality of mutton. Add boiling water in between to keep the consistency same. Now add Garam Masala Powder and 1 Tsp. of Ghee to finish Niramish Mangsho. I prefer a slow cooking process for this particular dish, however, if you are out of time instead of a pan use pressure cooker and cook till 3 whistles coming from the vent weight. To give the curry a more dominant red color, use Kashmiri Red Chili Powder instead of the normal one. The the amount of Sugar will be depending on the taste-bud. If you wish, can ignore Ghee completely but that will obviously decrease the special flavor of the dish.